What are the issues associated with putting paper and card in my organic waste bin? What are the issues associated with putting paper and card wastes in my organic waste bin? Most paper and card items contain plastic coatings, metals, inks or other ingredients that tend not to biodegrade enough during composting so are likely to result in low quality compost (e.g. containing pieces of plastic). Such compost is not acceptable to customers and can damage the environment, animals and our food supply chain. The above paper and cardboard types should not be disposed of in the Council organic waste bin so that high quality compost can be produced and used beneficially and without damaging the environment, animals and our food supply chain. More detailed information about the issues associated with paper and cardboard when these are sent to a composting site can be found HERE. Some local authorities have decided to remove all forms of paper and cardboard from the organic waste collections, even if there are few types that can be composted (for example, toilet roll and kitchen roll tubes). This is because, even when 'good', compostable paper and cardboard is accepted in the organic waste bin, it is very likely that also other undesirable paper and cardboard will end up in the bin and will arrive at the composting plant. This may result into compost containing fragments of plastics and other undesirable materials in it. Some local authorities that have removed paper and cardboard from the organic collections have been telling the householders that Âthis is because of a change in regulation' or is to do with 'a change in AfOR's standard for composts'. Recent Government's policies are pushing local authorities to collect organic wastes that can be converted into high quality compost that meets the BSI PAS 100 Specification. This is why local authorities are making an effort to improve the quality and reduce the undesirable materials in the organic wastes they collect. What 'BSI PAS 100 specification' is? ÂBSI PAS 100' is a specification for quality compost, published by the British Standard Institution (BSI). When compost is produced to this specification, you can be sure it is produced to a high standard and is safe to use. According to this specification, compost is sampled and tested to ensure the product conforms to the compost specification PAS 100 and is fit for use, consistent and reliable to use. For example, the amount of undesiderable materials in the compost, like plastics and fragments of printed and plastic-coated paper and card, are tested in the compost and must not exceed certain maximum limits. These limits have been recently changed and made stricter, due to the compost users' demand for high quality composts that can be used beneficially and without damaging the environment. In summary, compost that contains fragments of plastics, paper, card and other undesirable materials will fail to meet the changed limits in the PAS 100 specification and won't be accepted by the end market. 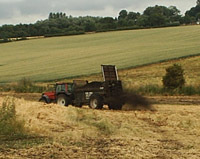 In addition, the Environment Agency won't allow such a compost to be spread on land, with the result that it may end up in landfill. You can read information about BSI PAS 100 here: http://www.wrap.org.uk/downloads/Introduction_to_BSI_PAS_100-20052.bfc500b5.2181.pdf.